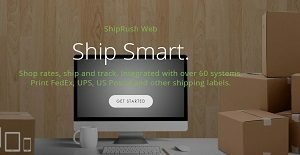 ShipRush Web is cloud-based and integrated shipping software suitable for small-medium businesses and allows controlling shipping processes more efficiently. Businesses get a single platform to manage a variety of operations as the platform seamlessly integrates with various marketplaces, carriers and carts. The real-time dashboard provides an intuitive interface to control the shipping processes, delivering a smart solution that makes managing operations easier. The platform can be integrated with over 60 eCommerce marketplaces, carriers and carts, which helps streamline processes. It allows automatic downloading of eCommerce orders into a central database for more efficient management and processing. In addition to integration with eCommerce marketplaces, the platform also integrates well with some of the most popular accounting software and CRMs and payment services. ShipRush Web is particularly suitable for small and medium eCommerce-focused businesses and allows them to serve their customers in a better way. It helps get orders out faster and supports delivery in most countries around the world. The platform automatically notifies customers about their order status via email and allows them to see the complete history from a single interface. Users can download all eCommerce orders at one place as the platform can seamlessly be integrated with over 60 eCommerce marketplaces and carts, including Amazon, Etsy, eBay and more. The platform can be connected with most major US and Global carriers, including FedEx, UPS, Worldwide Express, USPS and more. It allows on-the-fly switching between LTL shipping, Freight and Parcel and also supports special instructions like delivery windows and returns. The Rate Dashboard allows users to analyze and compare carrier fees and delivery options in real time and ensures that businesses get the best possible rates. This means that instead of looking separately at carrier accounts, users only have to use a single dashboard to compare rates, which saves valuable time and allows businesses to focus more on growth. Automatic, accurate and fast label printing saves users from importing/exporting or copy/pasting labels as they can easily print up to 500 labels each day. The platform supports label printing for FedEx, UPS, USPS, Pitney Bowes and other major carriers. Users can print remotely, while the platform also supports remote site and drop shipping. Every business has its own characteristics, and might need a special Sales Software solution that will be adjusted to their business size, type of clients and staff and even individual niche they cater to. You should not count on locating an ideal app that is going to work for every business no matter what their history is. It may be a good idea to read a few ShipRush Web reviews first and even then you should keep in mind what the software is intended to do for your company and your workers. Do you need a simple and intuitive service with only essential functions? Will you actually make use of the advanced tools required by pros and large enterprises? Are there any particular features that are especially beneficial for the industry you operate in? If you ask yourself these questions it is going to be much easier to find a solid software that will match your budget. How Much Does ShipRush Web Cost? We realize that when you make a decision to buy Sales Software it’s important not only to see how experts evaluate it in their reviews, but also to find out if the real people and companies that buy it are actually satisfied with the product. That’s why we’ve created our behavior-based Customer Satisfaction Algorithm™ that gathers customer reviews, comments and ShipRush Web reviews across a wide range of social media sites. The data is then presented in an easy to digest form showing how many people had positive and negative experience with ShipRush Web. With that information at hand you should be equipped to make an informed buying decision that you won’t regret. What are ShipRush Web pricing details? What integrations are available for ShipRush Web? If you need more information about ShipRush Web or you simply have a question let us know what you need and we’ll forward your request directly to the vendor.